It’s no lie that if anything is true about her, Julie Taymor loves to create a dynamic palette. Known for her films Frida and Titus, as well as her musical version of The Lion King, Ms. Taymor is a director who knows that the best way to amaze people is by flashing visuals that seem to pop off the screen and the stage. Wow them first, and then they’ll think later. Of course, such a style led to her last film, Across the Universe, a hodgepodge of a film that came close to ruining any sort of name The Beatles have. Even so, Ms. Taymor’s work seems a little too big for the New York Film Festival, which prides itself on filmmakers who often have none of her computer graphic trickery, and prefer the suggestive use of the camera to create ideas. 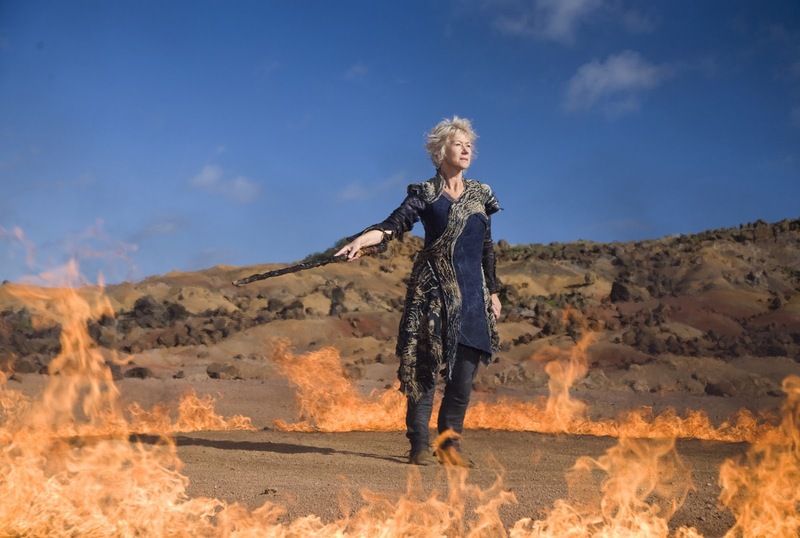 Which is why, her newest film, an adaptation of Shakespeare’s final comedy, The Tempest, is a bit of an overreaching explosion for the festival. The film is big, loud, and slightly abrasive, and while it is sometimes magical, its traded in the heart of the play for a big show. At least the key difference between other productions of The Tempest and Ms. Taymor’s version strikes an excellent chord. The sorcerer Prospero has been renamed Prospera, and changed genders to be filled by the shoes Helen Mirren. Ms. Mirren is a charismatic actress, and one who knows how to control the screen. Despite wearing costumes that border on the humorous side, Ms. Mirren commands the screen as great her Prospera controls the poor island she rules over. She is a natural Shakespearean actress, a shame when one considers how few Shakespeare roles are available for her without a change. The film thus opens with Prospera conjuring a grand storm upon the ship of the King of Naples, a position that she has the right to, but lost due to a misogynist group of leaders (the only real use of the gender change). Thus, Prospera shipwrecks the motley crew on her island, and we see their adventures, as we as hers. The rest of the cast—a surprisingly small one given the grandiosity of the film (mostly Taymor’s visual work)—fills into a mixed bag, which is where natural Shakespeare actors may have been prepared. Ben Whitshaw, still in John Keats mode from Bright Star, plays the spirit Ariel through a number of CGI tricks, mostly distracting more than insightful. Chris Cooper plays Prospera’s treacherous brother, and a companion to the king, played with no energy by David Stratharin. Djimon Hounsou plays the slave Caliban, and Ms. Taymor makes no attempt to clean the blatant Orientalism displayed by Shakespeare (though the visual costume—a series of paints and earthly crust attached to his body—is quite extraordinary. The surprising best part of Ms. Taymor’s The Tempest comes from its drunken comedic side, with Russell Brand and Alfred Molina as bumbling idiots. Yet acting isn’t Ms. Taymor’s problem, it’s her love of visual design. Ms. Taymor is more obsessed with what she can show in cinematic form, that she often literalizes the words of Shakespeare, without considering their thematic meaning. The big visuals and rock score are sometimes cheesy, and unfortunately rarely a new take on the ideas more than a big version of it. As the film drags on—despite its short length—it seems Ms. Taymor is more interested in the next effect than the next idea. When all the characters come together in what should be a big climatic showdown, her Prospera’s daughter exclaims the play’s famous lines, “O brave new world, That has such people in’t,” it takes a minute to even begin to feel palatable considering how thinly sketched Ms. Taymor has made these iconic characters. Ms. Taymor has done stage version of The Tempest, and I would have wished to see what she could do without such visuals to fall back on for her magic. The real magic of Shakespeare after all, is in the construction of the words.